In celebration of the 21st anniversary of the Hubble Space Telescope’s deployment into space, astronomers at the Space Telescope Science Institute in Baltimore, Md., pointed Hubble’s eye to an especially photogenic group of interacting galaxies called Arp 273. 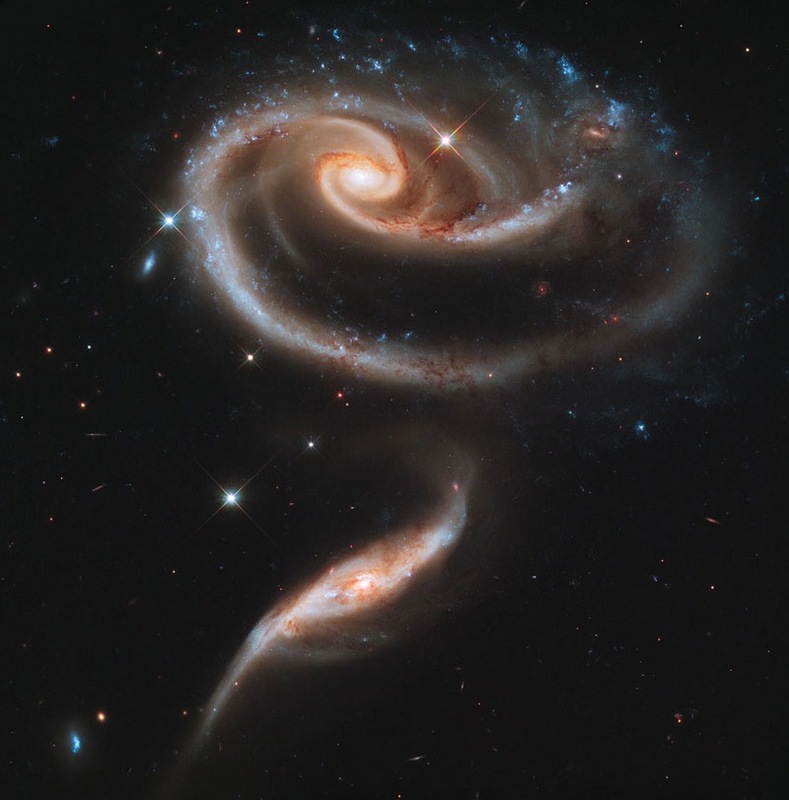 The larger of the spiral galaxies, known as UGC 1810, has a disk that is tidally distorted into a rose-like shape by the gravitational tidal pull of the companion galaxy below it, known as UGC 1813. A swath of blue jewels across the top is the combined light from clusters of intensely bright and hot young blue stars. These massive stars glow fiercely in ultraviolet light. The smaller, nearly edge-on companion shows distinct signs of intense star formation at its nucleus, perhaps triggered by the encounter with the companion galaxy. A series of uncommon spiral patterns in the large galaxy is a tell-tale sign of interaction. The large, outer arm appears partially as a ring, a feature seen when interacting galaxies actually pass through one another. This suggests that the smaller companion actually dived deep, but off-center, through UGC 1810. The inner set of spiral arms is highly warped out of the plane with one of the arms going behind the bulge and coming back out the other side. How these two spiral patterns connect is still not precisely known. The larger galaxy in the UGC 1810 – UGC 1813 pair has a mass that is about five times that of the smaller galaxy. In unequal pairs such as this, the relatively rapid passage of a companion galaxy produces the lopsided or asymmetric structure in the main spiral. Also in such encounters, the starburst activity typically begins in the minor galaxies earlier than in the major galaxies. These effects could be due to the fact that the smaller galaxies have consumed less of the gas present in their nucleus, from which new stars are born. Arp 273 lies in the constellation Andromeda and is roughly 300 million light-years away from Earth. The image shows a tenuous tidal bridge of material between the two galaxies that are separated by tens of thousands of light-years from each other. The interaction was imaged on December 17, 2010, with Hubble’s Wide Field Camera 3 (WFC3). This Hubble image is a composite of data taken with three separate filters on WFC3 that allow a broad range of wavelengths covering the ultraviolet, blue, and red portions of the spectrum.